According to the band’s Twitter page, they are currently recording the music video for Missing. You can view lots of pictures on their FaceBook. Here’s one just to give you guys an idea of what to expect! 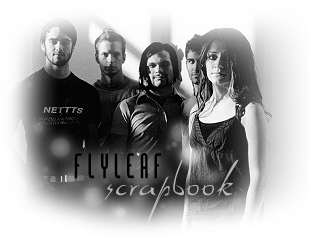 For this upcoming tour, I’m going to be putting together another Flyleaf Scrapbook to give to the band. If Memento Mori has moved you in any way (or anything else related to the band), please share it here. I have a feeling this one is going to be a good one. :D I think this will be number 5! Thanks for the update the missing video should be great love the pictures. Im going to the feb 16th show to see Flyleaf and i know there not the headliner but are they going to play a full setlist. stoked about the new vid! Can't wait for the missing Video! Can't wait for the new video, it looks great! Have any of you seen this list? I don't know, I mean the cover art IS pretty terrible. I was so disappointed when I saw it. Yes, the concept may be great and all, but the execution… pretty terrible. They should have just made Pat's woodcut the cover, end of story. Instead we have a shoddy photoshop job. It's just sad more than anything else. I saw the pictures on facebook a few days ago; Lacey's dress is awesome. Art doesn't have to be pretty. It doesn't have to make sense. It's all what people think of it and make it out to be. I like the cover, because it goes with the story, and it's not the average cover. The band has put a lot of work into Memento Mori, and they knew not everybody would like it. But anyway. Yea. Yes it is. Jared and Pat use it a lot. flyleaf is the BEST!!! !i LOOOOOOOOOOOOVE the song,"CHASM"!!!!! ROCK ON, LACEY MOSLEY!!!!!!! i love all the songs!!!!!!!!!!!!!!!!!!!!!!!!!!!!!!! !